The key to successful e-Leave HRM implementation is the flexibility of the system. Our e-Leave HRM system is continuously evolve around our customers. We welcome our customers to demand our developer team to fulfill their requirements, and so on, we keep building a better solution for all. You can easily attach photos of your document for leave application. 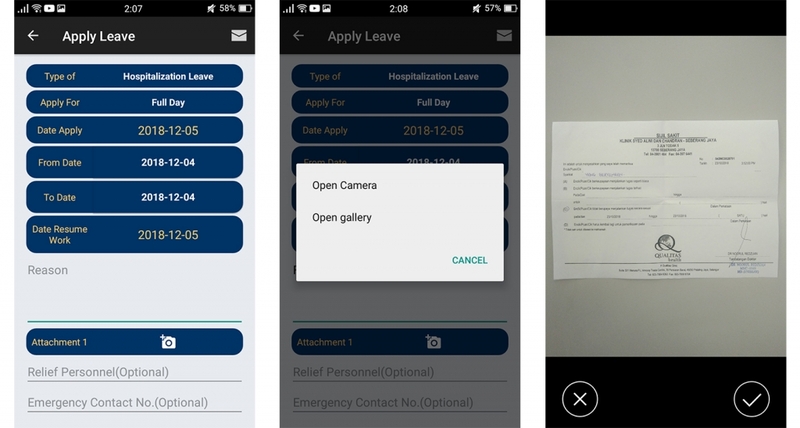 Use mobile phone to snap any supportive document (medical certificate, emergency leave, and etc.) for attachment. Once done take a photo of your document, it will be uploaded to the system. 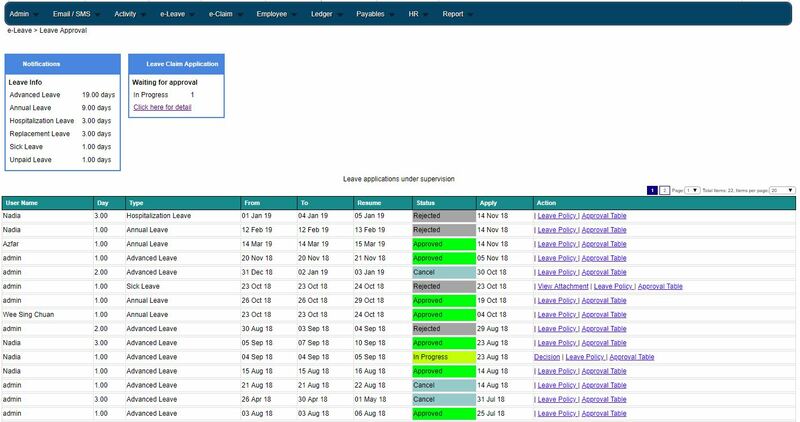 The e-Leave HRM is on the cloud, providing an always on facility to your business. You can get or apply e-Leave HRM from a web browser or using android or iOS app. 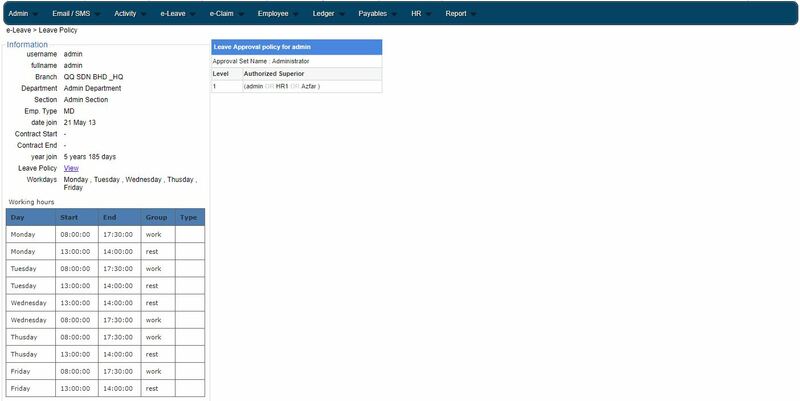 Employee self-service, very easy to use interface for even lower level employee to apply leave in a few steps. There are built in annual leave, advance leave, maternity leave, hospitalization leave, and etc. User can always define new leave type. Each leave have multiple options such as earn monthly, use once, parent leave type, allow carry forward and etc. Work pattern define when should employee come to work. You can define as many work pattern as you want, the work pattern can cater weekly, biweekly, monthly, or even alternate week. The week pattern is then use to calculate lateness, extra work hour, absent, lunch hour and etc. e-Leave HRM supports multi-level approval within same and different level (AND/OR). The email notification will be first sent to the first level Approver and they can approve in application or email. Status will be updated in real time. Company events, employees’ leaves and public holidays are tabulated in the calendar with different categories. 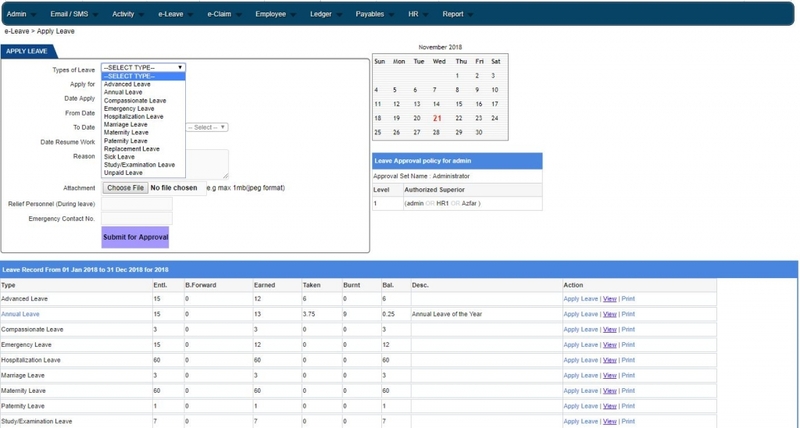 The calendar feature a pictorial format to eliminate paperwork and for better human resource planning. Automated calculation and allow user to define leave policy including cut off method and leave entitlement according to government regulation, the years of service and other company policies. Unpaid leave is calculated based on employee’s monthly salary.